Who says cards are just for birthdays and Christmas? Back in high school I had a crazy friend who used to send me Halloween cards. She’d send me Happy-Thanksgiving cards and Valentines and thank-you cards. She was just the card-sending type. Which is funny really since we saw each other every day at school. When I went off to college she still sent me cards all the time. Sometimes she would send me a photo of her pet gecko. She was just thoughtful like that. I would roll my eyes and tell her she was silly to waste postage on me when she could just say Happy This or That to my face, but after all these years I still think of her and her funny habits fondly. Once in a great while I still get the odd random card from her, but as our lives overlap less and less the cards get fewer and further apart. You know what? I miss her cards. I’m not irritated when I see the holiday decorations poke their heads out at grocery stores and craft stores earlier and earlier each year. I don’t care about Hallmark or whomever is trying to milk us for more and more money by reminding us about Be-Nice-to-Your-Dentist Day or World Crazy Socks Day. I think of it as a sweet reminder to send a card or a note or an email. Anything really. Maybe it’s a silly holiday but it’s an excuse to reach out. Even Halloween. As my daughter gets older, I’m trying to teach her the great art of correspondence. In my dreams she will send a postcard to someone every day. Of course our days are busy and those sentiments are often lost among errands and laundry and potty-training but every day is a new day to try. Lately our big thing is re-purposing her art. She’s still young enough that she doesn’t mind me “enhancing” her scribbles. I know the day will come when I won’t be allowed to touch her masterpieces and I’m ready for that. In the meantime, I’m making the most of her art. I gently influence the colors she paints with. 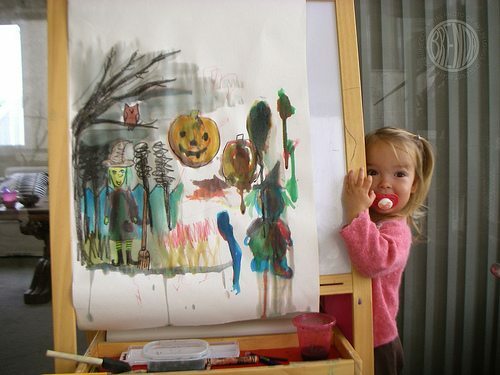 I show her by example how to color with crayon and then wash over it with black paint to make a spooky night scene. Sometimes she copies me. Sometimes she doesn’t. But so far our collaborations have been way more interesting than anything that I would come up with on my own. 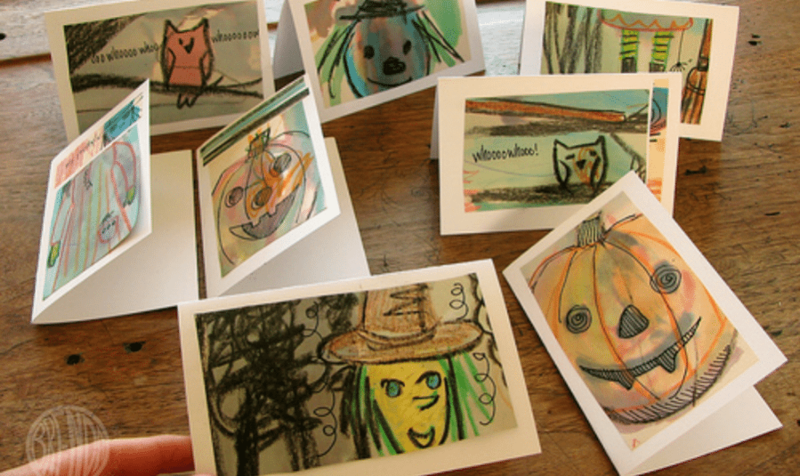 After we were done collaborating on our Halloween scenes, I sliced up her artwork and made Halloween cards. 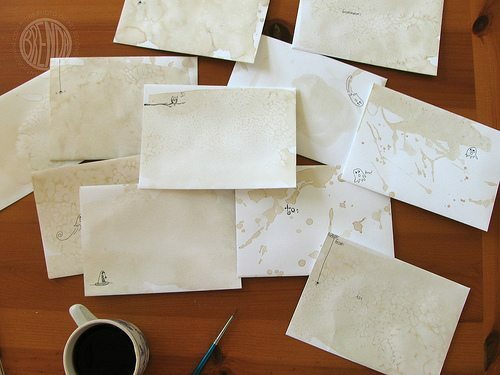 I had a box of cheap white envelopes but they weren’t scary enough all plain and white, so I painted them with coffee (no cream or sugar, please!) and then sprinkled salt on them. Salt repels the water and creates really neat designs when it dries and you scrape it off. It works even better if you grind the salt up first with a mortar and pestle. I think they turned out pretty cute. We’ll probably send them off to relatives and maybe even my crazy old friend if I can find her address. Who knows, maybe I’ll send you one. These are really cute, and a good way to use all that “art” that your little ones create! I’ve always sent Annalie’s artwork to grandparents and friends, but it never would have occurred to me to cut it up and make classier cards out of it. Thanks for the ideas, always! Very cool, great first post. I like how you cut out the images from one picture. You would never know by looking at the cards. They all look lovely. Further proof that you are THE MOST CREATIVE PERSON I KNOW. Creative person and good mom. Just one concern: the witch in those cards looks so friendly, she ain’t gonna scare anyone! And now thy can be shared with friends and family! These are absolutely fabulous. What a great idea. Oh, I love these. They’re so gorgeous. My daughter just had a birthday party and these would make fantastic thank you cards. These are GORGEOUS! I’m loving your blog so, SO much! I’ll be linking to this post. Lovely story. Handmade and handwritten cards are so special. 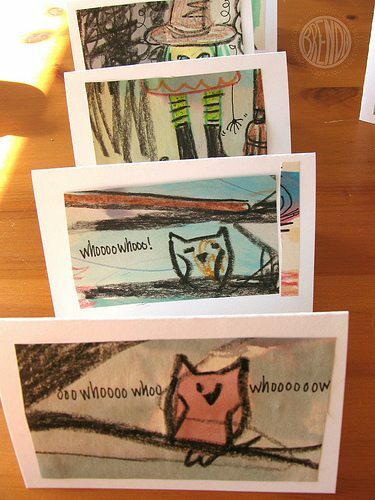 You’ve inspired me to take my kid’s pencil drawings and make it into ooak cards. Thanks for sharing! i love everything you do. and love you find the time to teach your daughter so much. 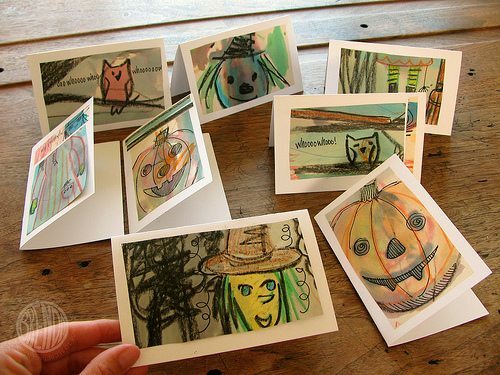 the halloween cards are great and the envelopes are simply the best… i wish i had found you BEFORE Halloween tho. i love the size of your easel too and i realize we probably don’t live anywhere near each other but where did you find it? .. all i can find are tiny flimsy ones … that will tumble to the ground if someone pushed to hard with a brush.